Alloying with aluminium can mitigate the hydrogen embrittlement of twinning-induced plasticity steels. First-principles calculations indicate a new mechanism for this observation, that aluminium atoms are weak traps for hydrogen, because of a local dilation around them. This in turn allows the aluminium-containing steel to absorb more hydrogen, as confirmed by previously unexplained observations in the literature. 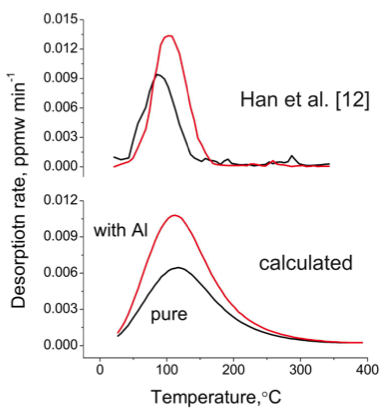 Calculations using the Oriani theory show that aluminium can retard the diffusion of hydrogen in twinning-induced plasticity steel via the atomic trapping mechanism. Scripta Materialia 87 (2014) 9-12. Download: calculation input file (in.txt), output (RESULTS.txt) and excution file (tds.exe). The simulation results, H amount and diffusivity results from Oriani equation and the data from literatures in the file (RESULTS).